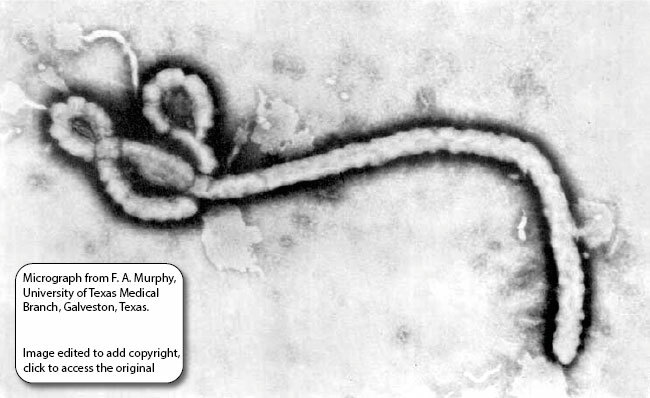 Filamentous 970 nm long for Ebolavirus. Diameter is about 80nm. Negative-stranded RNA linear genome, about 18-19 kb in size. Encodes for seven proteins. The primary product of the unedited transcript of GP gene yields a smaller non-structural glycoprotein sGP which is efficiently secreted from infected cells. RNA editing allows expression of full-length GP. Cellular receptor like HAVCR1 (TIM1 ) binds phosphatidyl serine on virion membrane and a signal is transduced into the cell that trigger the macropinocytosis program by apoptotic mimicry. The virion enters the cell by Macropinocytosis . In some culture cells, GP glycoprotein can be processed by host Cathepsin L and Cathepsin B into 19kDa GP1 . 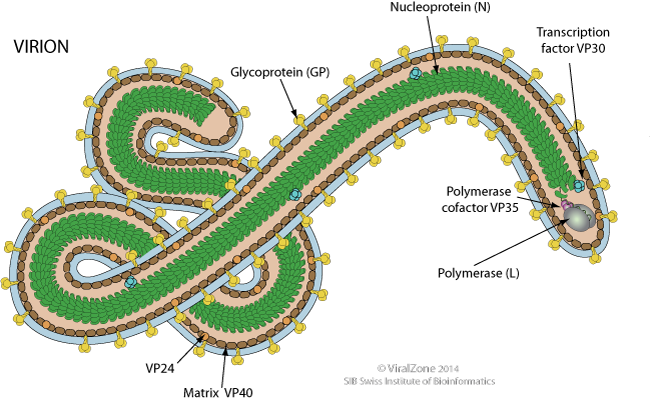 But this processing is not happening in all cells or for all ebolavirus . 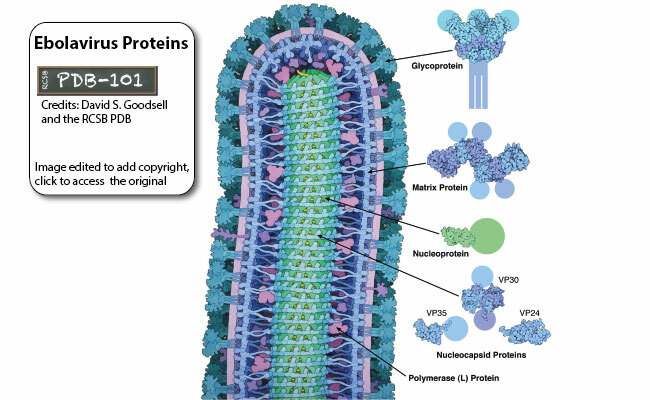 GP1 interacts with host NPC1, in late macropinosome and promotes Fusion of virus membrane with the vesicle membrane . The ribonucleocapsid is then released into the cytoplasm. The ribonucleocapsid interacts with the matrix protein, and buds via the host ESCRT complexes from the plasma membrane , releasing the virion . Vp24 protein block interferon signaling by preventing STAT1 signaling. May act by binding host karyopherin ? proteins, thereby preventing them from transporting the tyrosine-phosphorylated transcription factor STAT1 to the nucleus. May directly bind to STAT1 to prevent its signaling . Small Glycoprotein (sGP) is a secreted truncated version of GP that prevent host antibodies anti-GP to effectively neutralize it .